Though it isn’t as big of a deal in North America as pretty much anywhere else, it is world cup time! The US team isn’t a favorite and the Canadian team didn’t even qualify. Here are 2 interesting articles from Slate about the games and the differences between the US and I think Canada and the rest of the world. I definitely plan on watching soccer and I don’t have a favorite team. Do you? The Loneliness of the American Soccer FanThe world’s most popular sport is on the rise in the United States—and my neighbors still couldn’t care less about the World Cup. By Daniel GrossPosted Thursday, June 10, 2010, at 12:38 PM ET Being a soccer fan at World Cup time in America is a little like being Jewish in December in a small town in the Midwest. You sense that something big is going on around you, but you’re not really a part of it. And the thing you’re celebrating and enjoying is either ignored or misunderstood by your friends, peers, and neighbors. It can be a lonely time. But the World Cup is much bigger than Christmas. After all, only a couple of billion people in the world celebrate Christmas; the World Cup is likely to garner the attention of a much larger audience. Yet in the world’s largest and most important sports competition, the American team, and the American audience, is a marginal, bit player. And for those of us who love the game of soccer and the World Cup, and for the few of us who followed the ups and downs of Landon Donovan’s career, these next couple weeks are likely to be bittersweet. Of course, it’s getting less lonely. 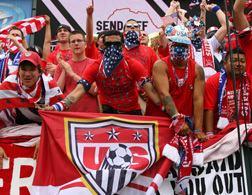 The United States has a growing soccer culture, thanks in part to the rise and growth of MLS. The atmosphere at games in Seattle and Toronto is quasi-European, with crowded stadiums and singing fans holding up scarves. A huge, partisan crowd showed up for the U.S. national team’s final send-off game against Turkey in Philadelphia. But as a rule, the world game remains a niche product here. Television ratings for MLS and U.S. national team games are minuscule. When Team USA plays World Cup qualifiers at home, it’s common for American fans to be outnumbered and outshouted by Costa Ricans, Mexicans, Guatemalans, Hondurans, whoever. Truth be told, there hasn’t been all that much to cheer for. In the 2002 World Cup, the United States made it out of its four-team round-robin group and whacked archrival Mexico in an exhilarating 2-0 game before going out to Germany in the quarterfinals. 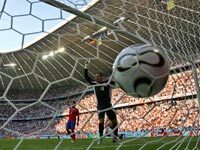 But the 2006 World Cup campaign essentially ended before it began, with the United States falling behind the Czech Republic in the fifth minute in the first game. Because of the nation’s historical incompetence at international soccer, Americans generally look at the World Cup the same way they look at other foreign phenomena like sovereign wealth funds, Bollywood, and China—as a potential marketing bonanza. The Wall Street Journal and other organs of the financial press have been filled with articles about the opportunities for consumer products, brands, and media. The international soccer community, likewise, sees America less as a budding soccer power than as a potential financial bonanza—why else would FIFA consider giving the United States the World Cup for a second time? As a result, if you’re interested in the game, and particularly interested in the U.S. team, you really don’t have that many people talk to. At a recent soccer practice, one of the other dads noted that his son wanted a jersey for some guy whose name he couldn’t remember but who might play for a Spanish team. “Lionel Messi?” I asked. From the lack of recognition on his face, I realized I may as well have said “Lionel Trilling?” I wanted to shout: “You know, the best player in the world? The mite from Argentina who moves faster with the ball than without it, whose low center of gravity lets him ride off tackles from much larger defenders, who schools the opposition the way Michael Jordan used to, who in April scored four goals against Arsenal—against ARSENAL, for god’s sakes!—in a Champions League game, who plays for Barcelona, possibly the most awesome and elegant club in the world, a team that gives its shirt sponsorship to UNICEF rather than selling it to some awful corporation? You mean that guy?” But what was the point? Talking with my neighbors about Lionel Messi would be like trying to engage a group of Amish farmers in a discussion about the merits of the 2011 Porsche Carrera. Oh, sure, you can find other enthusiasts. A few Slate colleagues pass around YouTube links to the latest sick goal. Urban hipsters are obliged to show some interest the game, the same way they do in CSAs, and facial hair (for men) and yoga (for women). On the Internet, there’s the high-brow crew over at the New Republic, (which features an ad for a book from Cornell University press on Spartak Moscow), the fine blogs No Short Corners and Yanks Abroad, and a rising volume of press coverage. But there’s nothing like the volume and sophistication of stuff our frères at Slate.fr are doing. If you want to follow the game, wince with every missed shot, and question coach Bob Bradley’s personnel choices, you’ll have to venture into the fever swamps of BigSoccer.com. There you will find some people who live and die with status updates of defender Oguchi Onyewu’s knee. But they’re only avatars. The True Story of American SoccerFrom The Thinking Fan’s Guide to the World Cup. By Dave EggersUpdated Thursday, June 10, 2010, at 6:55 AM ETThe 2010 World Cup marks the U.S.’s sixth consecutive appearance in the world’s pre-eminent soccer tournament. Four years ago, Dave Eggers asked why the game hasn’t quite captured America’s imagination, examining soccer’s history and status in this country through his own experiences following and playing the sport. The original article is reprinted below. A German goal at the World Cup When children in the United States are very young, they believe that soccer is the most popular sport in the world. They believe this because every single child in America plays soccer. It is a rule that they play, a rule set forth in the same hoary document, displayed in every state capital, that insists that 6-year-olds also pledge allegiance to the flag—a practice which is terrifying to watch, by the way, good lord—and that once a year, they dress as tiny pilgrims with beards fashioned from cotton. On Saturdays, every flat green space in the continental United States is covered with tiny people in shiny uniforms, chasing the patchwork ball up and down the field, to the delight and consternation of their parents, most of whom have no idea what is happening. The primary force behind all of this is the American Youth Soccer Organization, or AYSO. In the 1970s, AYSO was formed to popularize soccer among the youth of America, and they did this with startling efficiency. Within a few years, soccer was the sport of choice for parents everywhere, particularly those who harbored suspicions that their children had no athletic ability whatsoever. The beauty of soccer for very young people is that, to create a simulacrum of the game, it requires very little skill. There is no other sport that can bear such incompetence. With soccer, 22 kids can be running around, most of them aimlessly, or picking weeds by the sidelines, or crying for no apparent reason, and yet the game can have the general appearance of an actual soccer match. If there are three or four coordinated kids among the 22 flailing bodies, there will actually be dribbling, a few legal throw-ins, and a couple of times when the ball stretches the back of the net. It will be soccer, more or less. Because they all play, most of America’s children assume that soccer will always be a part of their lives. When I was 8, playing center midfielder for the undefeated Strikers (coached by the unparalleled Mr. Cooper), I harbored no life expectations other than that I would continue playing center midfielder until such time as I died. It never occurred to me that any of this would change. But at about age 10, something happens to the children of the United States. Soccer is dropped, quickly and unceremoniously, by approximately 88 percent of all young people. The same kids who played at 5, 6, 7, move on to baseball, football, basketball, hockey, field hockey, and, sadly, golf. Shortly thereafter, they stop playing these sports, too, and begin watching these sports on television, including, sadly, golf. The abandonment of soccer is attributable, in part, to the fact that people of influence in America long believed that soccer was the chosen sport of Communists. When I was 13—this was 1983, long before glasnost, let alone the fall of the wall—I had a gym teacher, who for now we’ll call Moron McCheeby, who made a very compelling link between soccer and the architects of the Iron Curtain. I remember once asking him why there were no days of soccer in his gym units. His face darkened. He took me aside. He explained with quivering, barely mastered rage, that he preferred decent, honest American sports where you used your hands. Sports where one’s hands were not used, he said, were commie sports played by Russians, Poles, Germans, and other commies. To use one’s hands in sports was American, to use one’s feet was the purview of the followers of Marx and Lenin. I believe McCheeby went on to lecture widely on the subject. At the same time, high-school soccer was booming in the suburbs of Chicago, due in large part to an influx of foreign exchange students. My own high-school team was ridiculously good by the standards of the day, stacked as it was with extraordinary players from other places. I can still remember the name of the forward who came from, I think, Rome: Alessandro Dazza. He was the best on the team, just ahead of Carlos Gutierrez (not his real name), who hailed from Spain and played midfield. Our best defender was a Vietnamese-American student named Tuan, and there was also Paul Beaupre, who was actually from our own WASP-filled town, but whose name sounded French. We were expected to win State, but we did not come very close. Homewood-Flossmoor, we heard, had a pair of twins from Brazil.